Ipswich town centre has seen many changes over the past decade, writes Ipswich Council Leader, David Ellesmere. One of the less obvious is the wholesale relocation of public sector jobs from the centre. Ipswich Borough Council, Suffolk County Council and the Police have all moved their offices away from the middle of town. The Inland Revenue and DVLA offices in St Clare House have closed completely. Added together there are hundreds, if not thousands, of people who used to work in the town centre and no longer do so. These are people who would once have popped into town at lunchtime for a bite to eat or to do some shopping. The cumulative effect this has had on the town centre economy must be significant. It serves a vital role in encouraging the hundreds of staff working in Russell and Constantine Roads to pop into the town centre at lunchtime. It may be a relatively short distance but without the shuttle bus, if it’s raining, you’re likely to look out of the office window and decide not to venture out. If you’ve got heavy shopping you won’t want to slog back from town with it and may use the car to go to an out-of-town retailer instead. The net result would be another reduction of people shopping in the town centre. 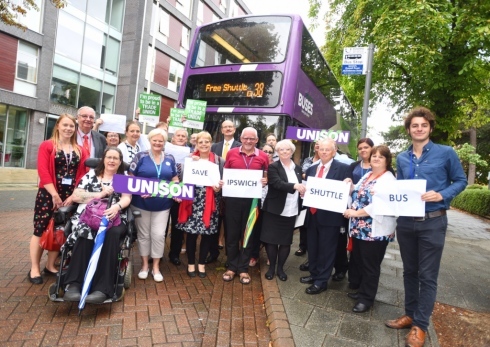 That’s why Ipswich Borough Council have stepped in to save the shuttle bus. We always made a contribution to the cost of running the service from the charges our staff pay to park. This same contribution is enough to fund a service over the crucial lunchtime period. The new shuttle bus will run from 11.30am to 2.30pm, Monday to Friday. If other organisations chip in we can increase the hours of operation. It will operate a shorter route via Upper Brook Street which means it can run every 15 minutes. Despite being paid for solely by Ipswich Borough Council staff it will remain free to use for everyone. It’s good for our staff, good for shoppers and good for town centre retailers.